When children waste away to literally nothing while fourteen million people face conflict driven famine, a hue and cry—yes, a caterwaul —most certainly should be raised, worldwide. On November 28, sixty-three U.S. Senators voted in favor of holding a floor debate on a resolution calling for an end to direct U.S. Armed Forces involvement in the Saudi-UAE coalition-led war on Yemen. Describing the vote as a rebuke to Saudi Arabia and the Trump Administration, AP reported on Senate dissatisfaction over the administration’s response to Saudi Arabia’s brutal killing of Jamal Khashoggi last month. 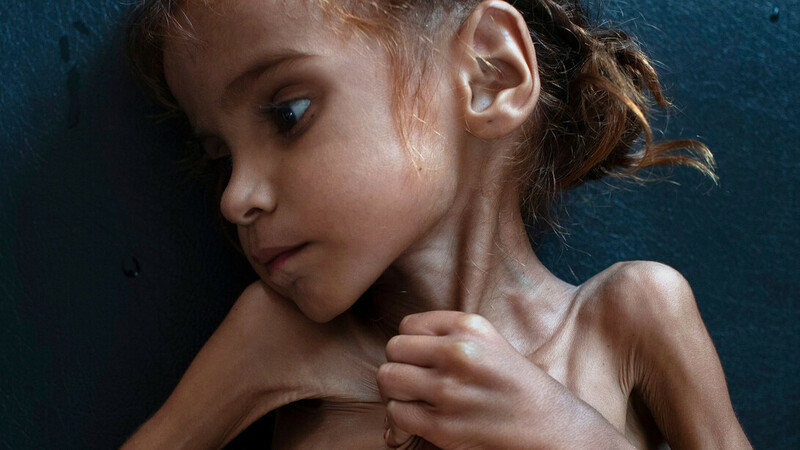 29 November 2018 (Wall Street International)*– As I stared at the picture of seven-year-old Amal Hussain dying of hunger I couldn’t contain my anguish, tears flooding my eyes. Some hours earlier I was wining and dining with friends whom I told about my revulsion at the world’s indifference at the Yemen tragedy, at the hypocrites of the West who shamelessly crawl at the feet of the butcher of Saudi Arabia Mohammed Bin Salman. The little Amal Hussain | Photo from Wall Street International. President Donald Trump imposes draconian sanctions on Cuba and Iran but fetes the thugs of Arabia, gloats about the $100 billion in weapons exports to one of the most undemocratic regimes in the world. Freida Pinto is one of the world renowned artists supporting the 50 for Freedom campaign to end modern slavery, led by the International Labour Organization and its partners. (*SOURCE: ILO). 2 December 2018 — Danai Gurira, one of the stars of hit movies “Black Panther” and “Avengers: Infinity War,” in her role as General Okoye, has been named a Goodwill Ambassador for UN Women, lending her name and dedicating her support to gender equality and women’s rights. UN Women Twitter | From left: actor and activist Danai Gurira Resse; Phumzile Mlambo-Ngcuka, Executive Director of UN Women; and actor and activist Reese Witherspoon taking part in International Women’s Day at UN Headquarters. COP24, the two-week 24th conference of the parties of the United Nations Climate Change Convention (UNFCCC), started on Sunday [2 December 2018] in Katowice, Poland, with a special focus on carbon neutrality and gender equality. Days after the UN sounded the alarm on the unprecedented levels of greenhouse gas concentrations in the atmosphere, the world is gathering to define how the 2015 Paris Agreement will be implemented and moved forward. 2 December 2018 — Slavery is still a very real and widespread phenomenon, affecting more than 40 million people worldwide, says the International Labour Organization (ILO), with children making up a quarter of the victims , despite the entry into force of the landmark Forced Labour protocol in 2016.